Austin, TX, USA /BUSINESS WIRE/–The long-awaited renovation of the Grand Hall at Union Station, St. Louis is now open to the public, highlighted by a state-of-the-art digitally integrated 3-D immersive media experience. Already a St. Louis landmark, the new lobby lounge renovation and multimedia attraction has completely transformed the historic space into a destination experience, bringing the signature, elaborate architecture to new life with cutting edge technology and dramatic visual content. Technomedia Solutions, Mood Media’s specialized creative innovation brand, conceived and developed the experience in collaboration with JRA (Jack Rouse Associates) for the original concept. In 2012, Lodging Hospitality Management purchased the 120-year-old Union Station with the goal of driving attendance to the station’s Grand Hall and adjacent bar/hotel. Their challenge for the $66.3 million renovation was how to accomplish this transformation without disturbing the hall’s historic architecture. One component of their overall solution was The Grand Hall Experience – a $1.8 million, ultra high-definition projection mapping show. Offered several times nightly and free to the public, the show is the first of its kind in the United States. Projected on the Grand Hall’s 65-foot tall, barrel-vaulted ceilings and across the entire space, the 3-D presentation is made up of a multitude of vignettes, taking guests on a fantastic journey from the depths of the sea to the Sistine Chapel to St. Louis’s Busch Stadium. 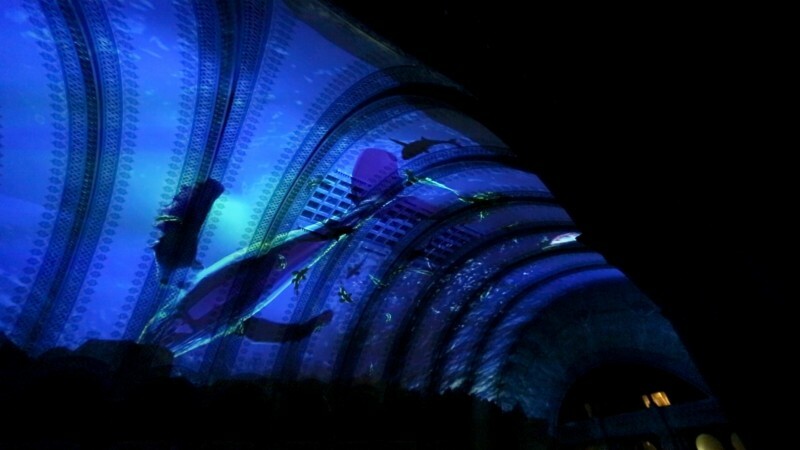 The 16-projector ‘holographic” light show employs 14 high-resolution projectors, digital media servers, consolidated control, 10-channel surround audio, and an LED lighting system to elevate the space and immerse the audience in the media event. Celebrity narration further enhances the experience, with St. Louis notables John Goodman, Bob Costas and John Hamm lending their voices to the show.